TIGARD — There were smiles. There were laughs. There were some high-fives. And there was a whole bunch of competition. 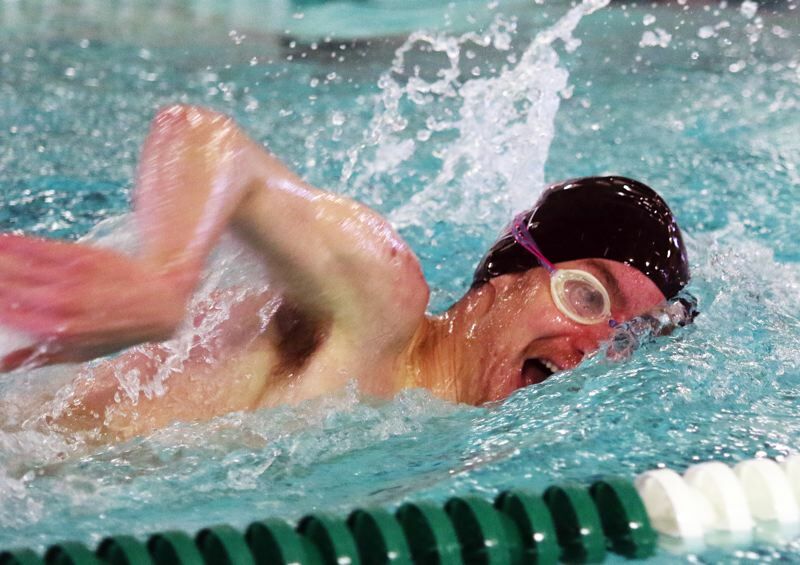 That's not a surprise, as that's usually the situation when the Tigard and Tualatin high school boys swim teams match up in the pool. And, last Thursday, the Timberwolves were able to battle their way past their friendly rivals to get a victory. 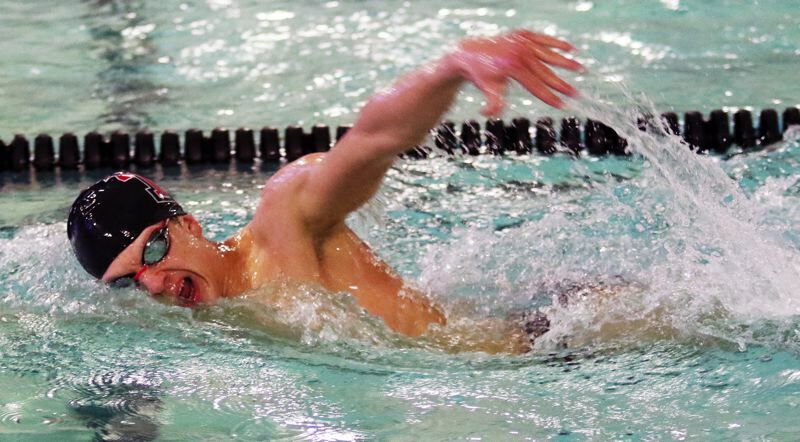 Tualatin, in a spirited event, was able to edge the Tigers, 87-78, in a Three Rivers League dual meet held last Thursday at the Tigard Swim Center. "For sure, it's special," said Tualatin senior Ryan Janetsky, who had a pair of individual wins at the meet. "A lot of the swimmers I know from club swimming are here, so I see a lot of familiar faces. That makes it more fun, competing with former teammates." "I enjoyed it a lot. I know a lot of these guys, and it was fun to race with them — so much more fun. 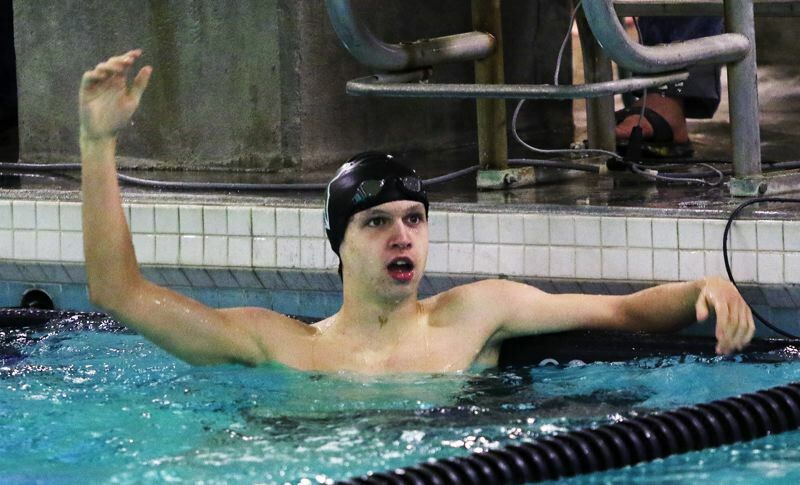 I loved it," said Tigard sophomore Nathaniel Whitehead, who also had a pair of individual wins. "They have a really good team, but I think we put up a really good fight. It was close, and I think we did really well." With the win, the Tualatin boys improved to 4-2 in Three Rivers League dual meet. The Tiger boys moved to 2-4 in league meets with the setback. Janetsky helped the Timberwolf boys get the team win with his two individual victories. "It was the luck of the draw," he said with a laugh. "It felt pretty good. At the start, I didn't feel like I'd be swimming that well, but I got some good wins and contributed to my team." Janetsky got his first victory in the 100-yard freestyle, where he had a time of 55.36 seconds. Later, he had a winning mark of 1:07.55 in the 100 breaststroke. "It was pretty good," Janetsky said of the victories. "I was coming off a break, so every event felt very tiring." Also for the Tualatin boys, senior Andrew Li sprinted to victory in the 50 freestyle in 24.91, and senior Connor Flory triumphed in the 500 freestyle in 5:00.55. In the 200 freestyle relay, the Timberwolf team of Li, sophomore Mason Weyrauch, senior Brendan Ehmig and Florey had a winning time of 1:42.70. For Tigard, Whitehead took first place in the 200 individual medley in 2:01.57 and he was victorious in the 100 backstroke in 55.99. "I was very happy with that," Whitehead said of his win in the backstroke. "I wanted below 56, and I was .01 off, so that was pretty good. I thought it was great." Whitehead also teamed with sophomore Jaden Nguyen, senior Ben Miller and senior Cameron Williamson to win the 200 medley relay in 1:45.22. The same four Tigers also won the 400 freestyle relay with a mark of 3:32.68. Miller, like Whitehead, was a four-time winner of the day. Miller won the 200 freestyle in 1:44.80 and he triumphed in the 100 butterfly in a pool-record time of 49.41. Next up for the Tigard and Tualatin boys teams will be the Three Rivers League district championships, which will be held Friday and Saturday at Mount Hood Community College. "I've got a couple things to work on, then I'll be ready," Janetsky said of the district meet. "I'm very ready for that," Whitehead said. Action at the Three Rivers League district meet is set to start at 9 a.m. each day.